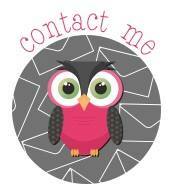 If you’d like to receive my newsletters, please leave a comment or email me and I’ll be sure to add you. 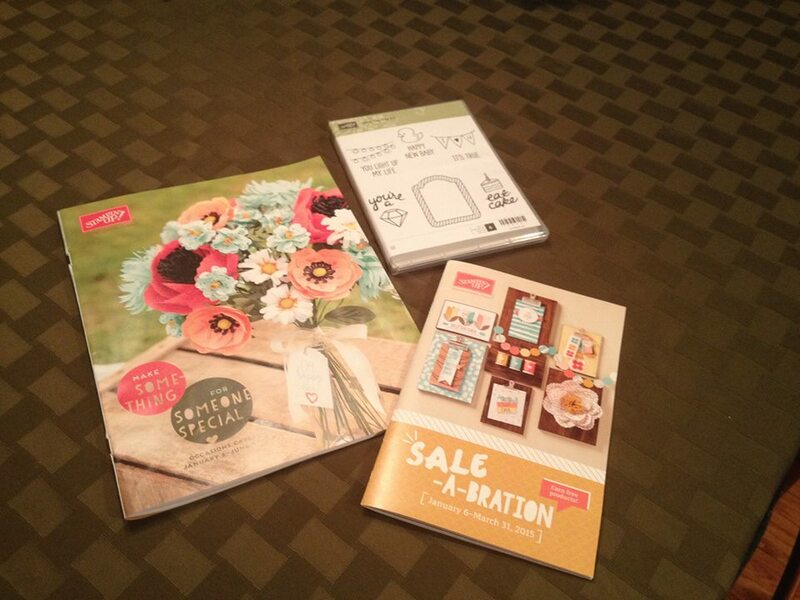 I didn’t want to leave you all out, so here are some of my recent creations from the new Occasions 2015 Catalog (aka “spring mini”) and Sale-a-bration catalog. They launch next Tuesday January 6th! 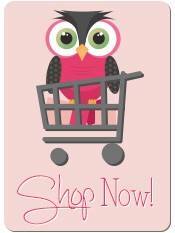 I’m so excited, it is such a wonderful compilation of products, I can’t wait to show them off to you. If you haven’t received a catalog yet- please let me know I’d be happy to get them out to you. 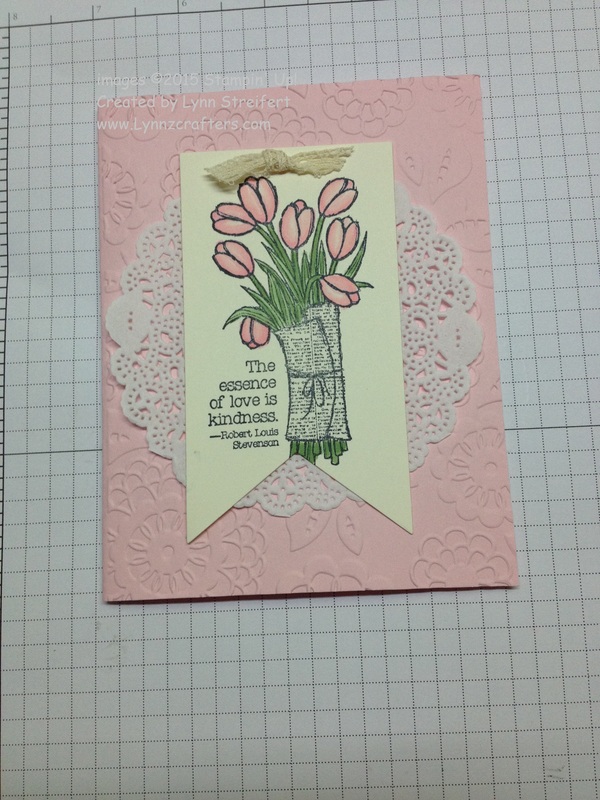 This new stamp is called “Love is Kindness” and I created this card for my sweet little sister’s birthday which was December 20th. Did you know my brother and sister are twins? Couldn’t give my little bro a card with flowers, ribbon or lace, so here is his birthday card. I’m so sad that White Christmas is not carrying over… if you want this stamp set, last day to order it is Monday January 5th. 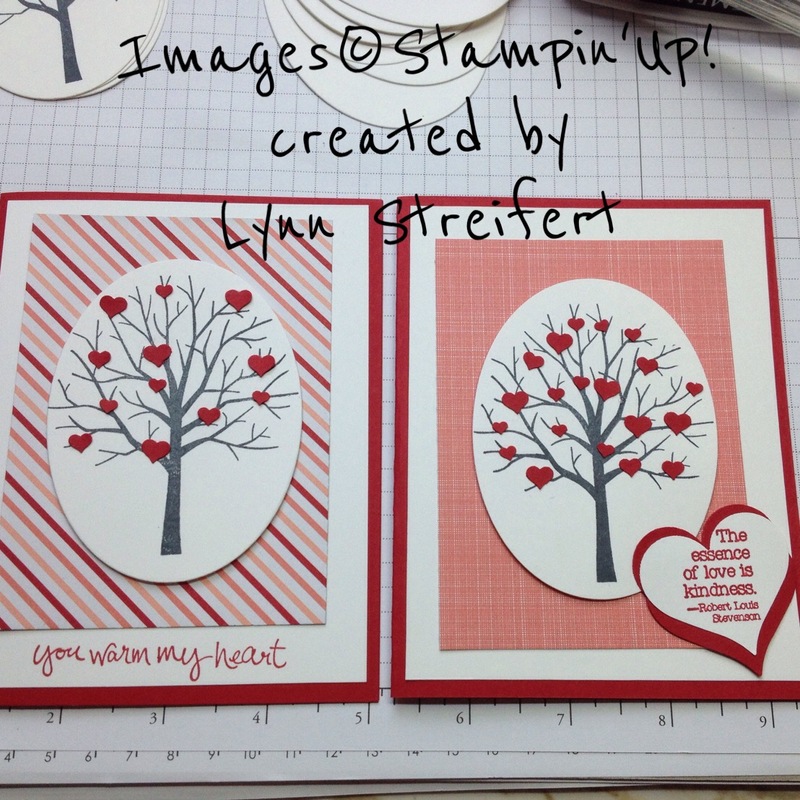 Next up is a card design I was having so much fun with… the card on the right we made at my Lynnzcrafters team get together which was on December 17th. Everyone loved it, but there was some trickiness to getting the saying from the new tulip stamp above (Love is Kindness) here… with a total of 3 hearts punched out. 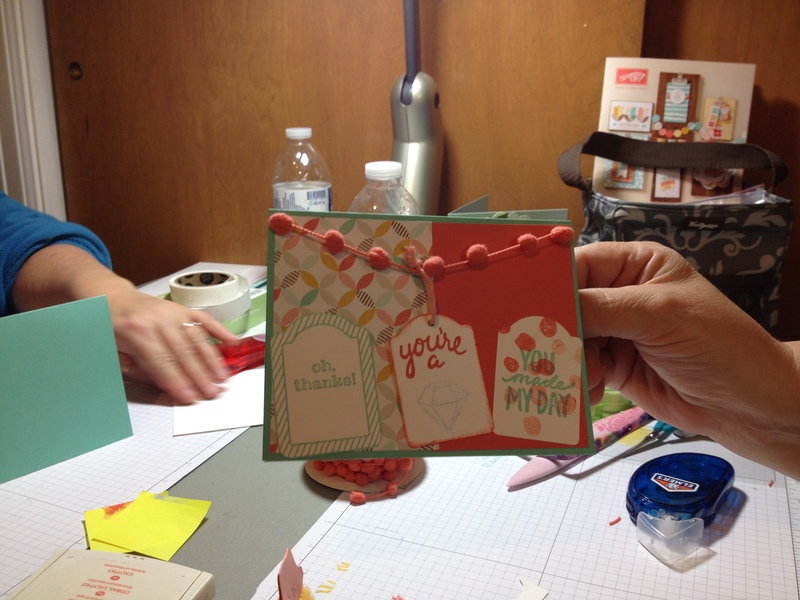 So when I was trying to finalize plans for one of my two cards swaps (I signed up for a 20 card swap with other demonstrators in the Ronda Wade training group) so I went with the card on the left for that swap. It was much easier to make 20 of them (although the little confetti hearts are tricky to adhere- use a toothpick and our tombow green glue). Do you just love this tree?? It is from the brand new Sheltering Tree stamp set, in photopolymer. Just love how easy it is to see and stamp!! So in the end, the way the new paper stacks work with their patterns, (Stacked with Love Designer Series Paper Stack), I had 3 variations, and mailed them out last Sunday (yes- I drove to Colonie Center post office to be able to get them to Iowa by Wednesday). This photo depicts the next dilemma I had. 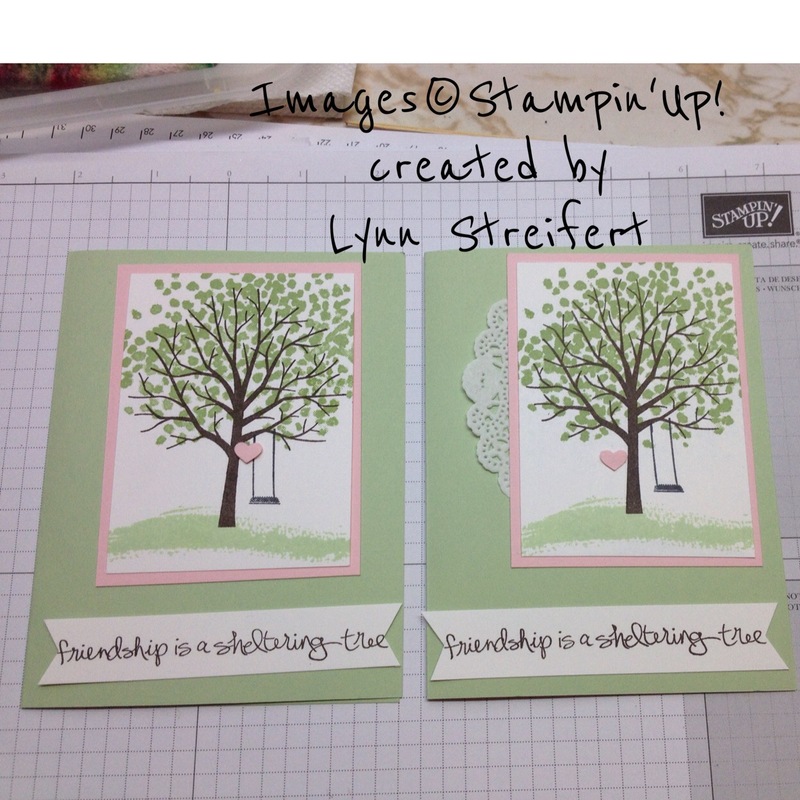 The second swap for Ronda Wade’s training group (I signed up for two 20 card swaps using the new stamp set Sheltering Tree). I liked it with the doily, but when I posted it to my facebook group, the votes were opposed to the doily. 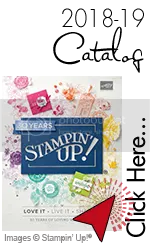 The good news is, I am thinking of doing the card for my January clubs… I think they will love getting their hands on this awesome new stamp set. I also went to the Christmas Tree Store and bought a window type frame and I am working on a 4 seasons framed art piece, stay tuned! Which one do you like doily or no?? 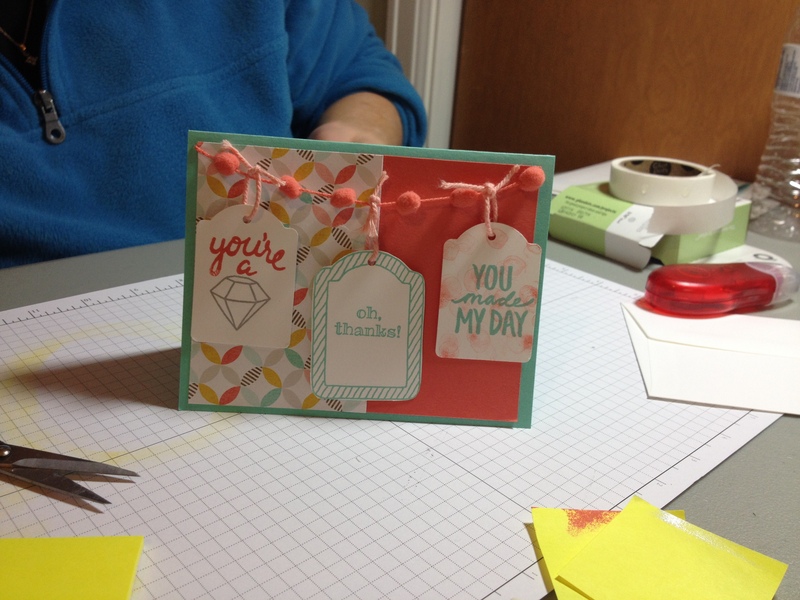 So this is a second card we made at my Lynnzcrafters team get together in December. 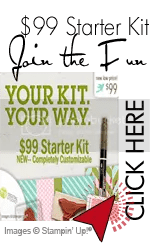 Notice all the new products?? It is just loaded with fun and I just ADORE our new chalkboard paper and chalkboard ink pads, so yummy! 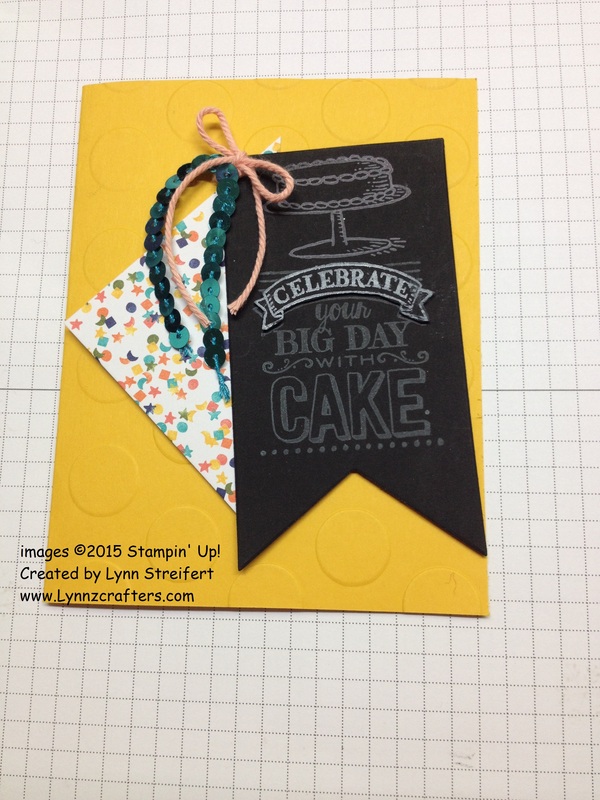 They go perfectly with this new Sale-a-bration (SAB) set- Big Day Stamp Set! so fun, you can add as many candles as you need. And new bermuda bay metallic sequin trim?? gorgeous! What do you think? Do you love chalkboard style as much as me? This was card #3 for my team get together, and also used the Love is Kindness stamp set- but notice anything else new about this card? New Blendabilities!!! That’s right, on page 32 of the new catalog, we offer you 4 new colors to add to your blendabilities collection. 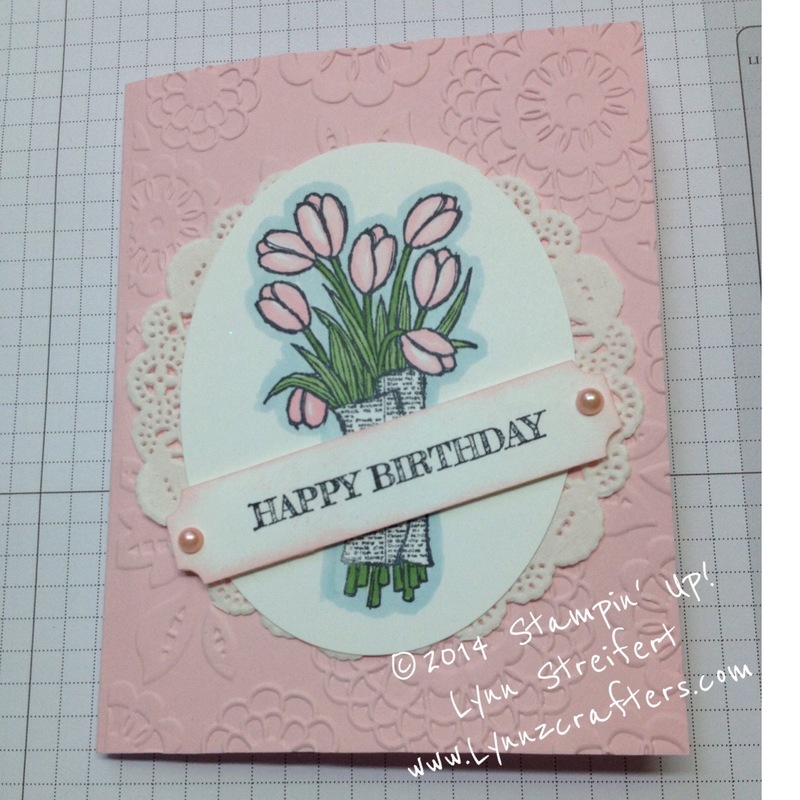 Bermuda Bay, Pink Pirouette (used here on the tulips), Soft Sky (used on the birthday card at the top of the page, I used this soft blue to outline the flowers)and Wild Wasabi (used here on the leaves and stems). I just love these new colors. 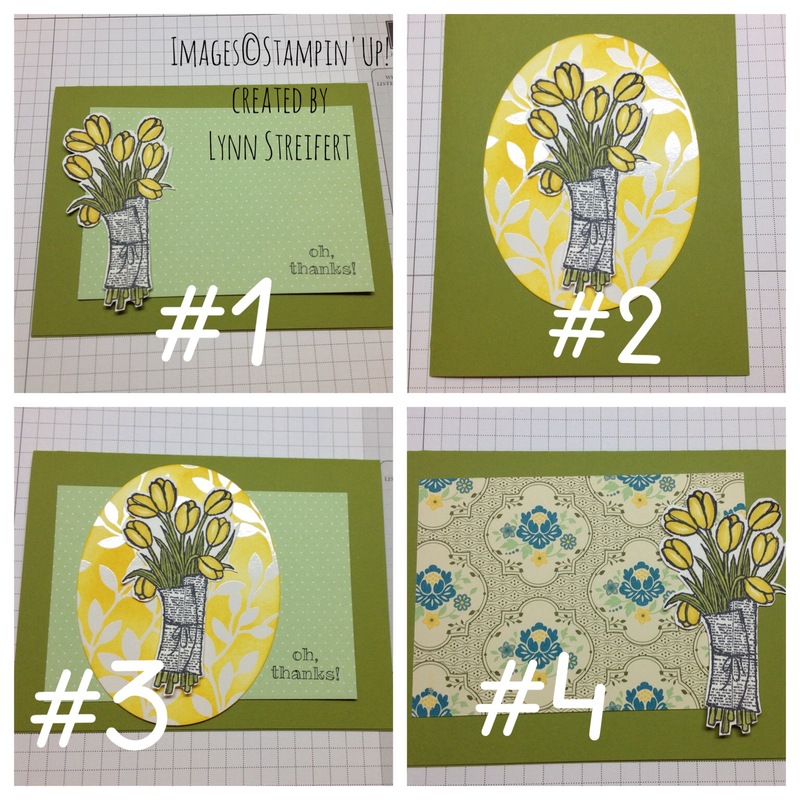 This collage of four versions of the tulips in yellow represents some “voting” I had over on the facebook page… this was a card I designed for my Paper Pumpkin rewards party which was Monday 12/29. It was a small intimate group, and we really enjoyed coloring together. Everyone made slightly different versions of their final card, want to see them?? 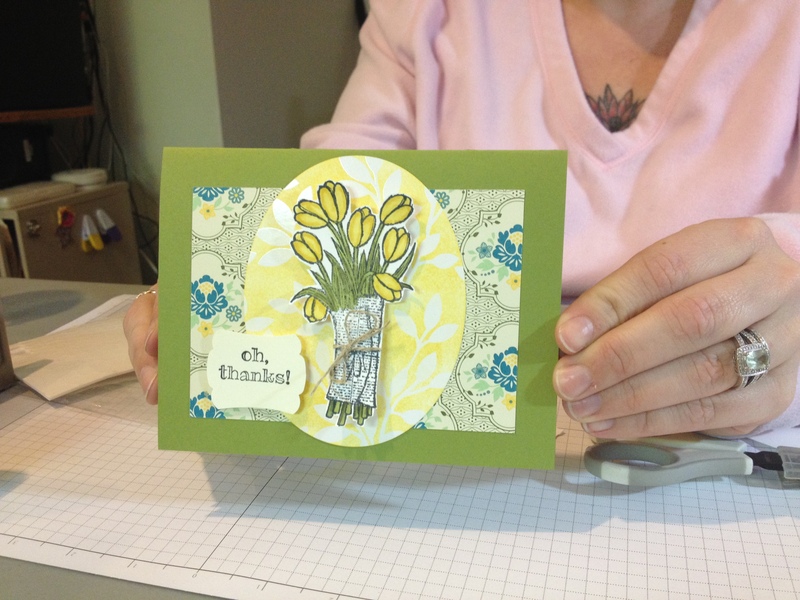 This was Tiffany’s card- she trimmed down the “oh thanks” that she punched out with the Artisan Label punch. 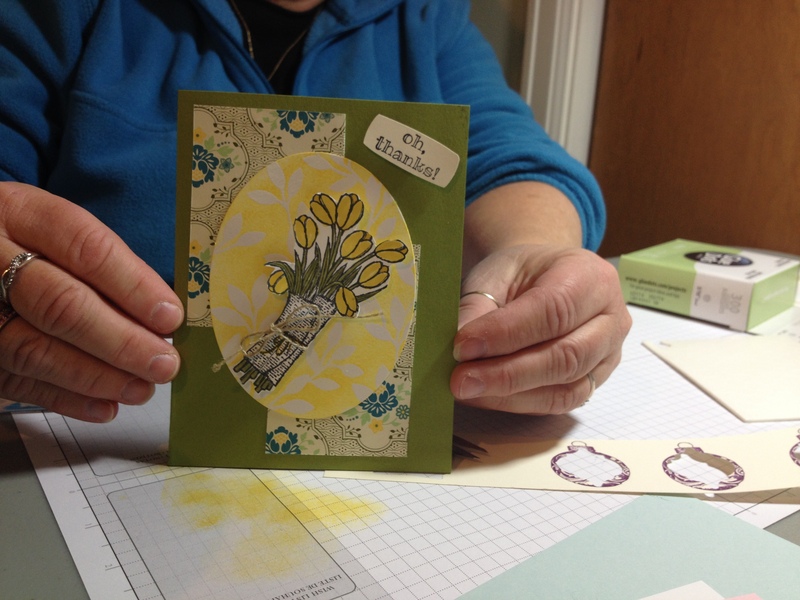 This was Sharon’s version, nice offset, don’t you think? 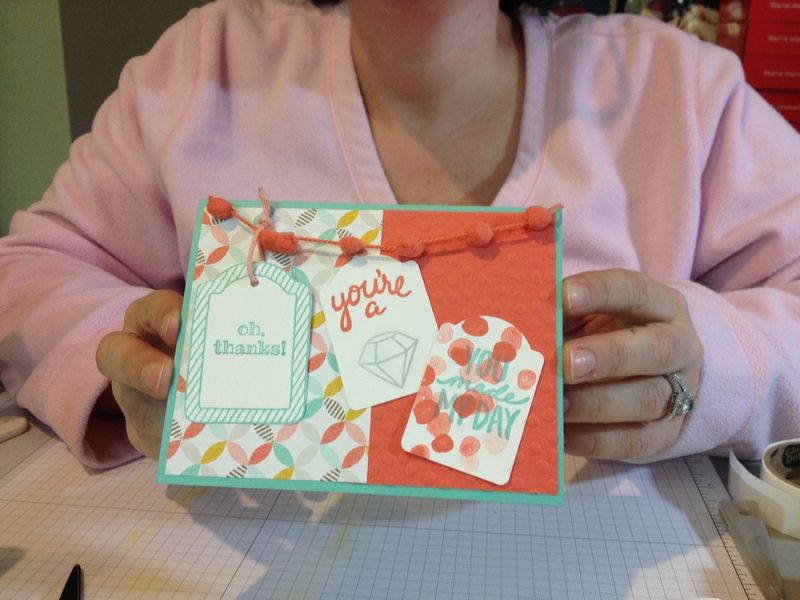 This was Joan’s rendition- she trimmed the DSP in half to separate it here, love it! 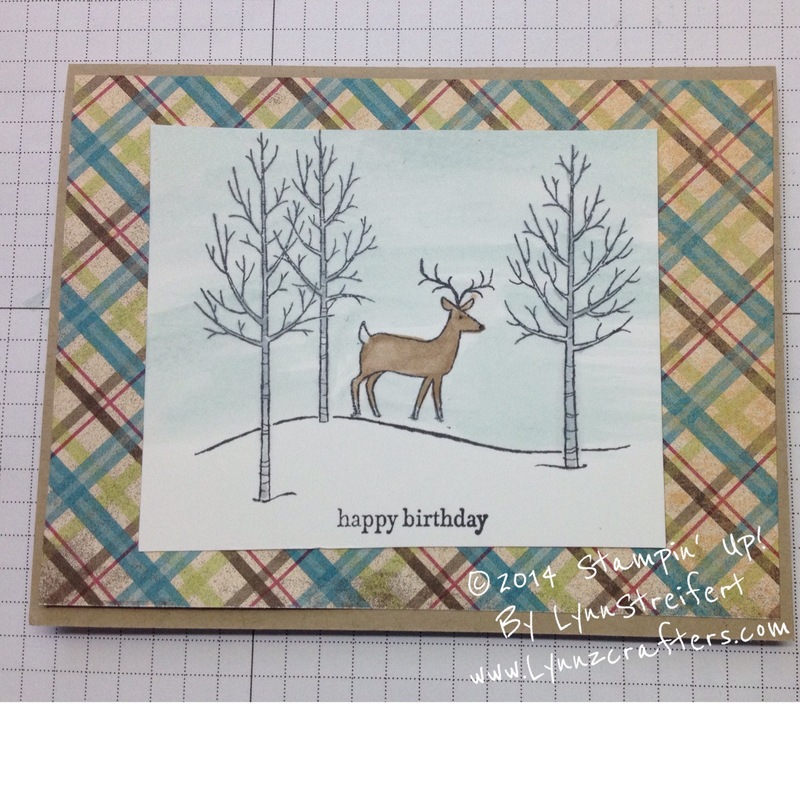 This was another card I designed to feature the new blendabilities- this stamp is from the Annual Catalog- can you believe I bought it back in July and had never mounted it yet? 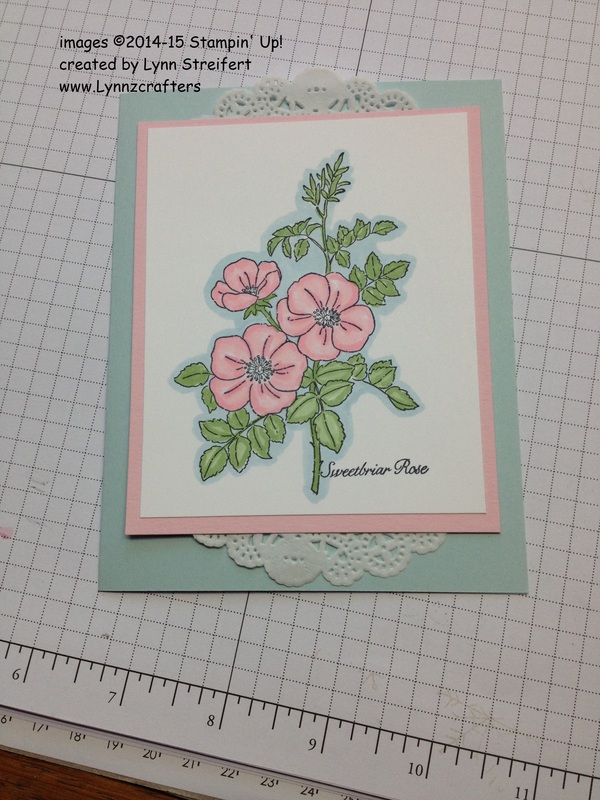 So this was the first time I used it, called Sweetbriar Rose it’s on page 170 of the big catalog, just loved coloring it. 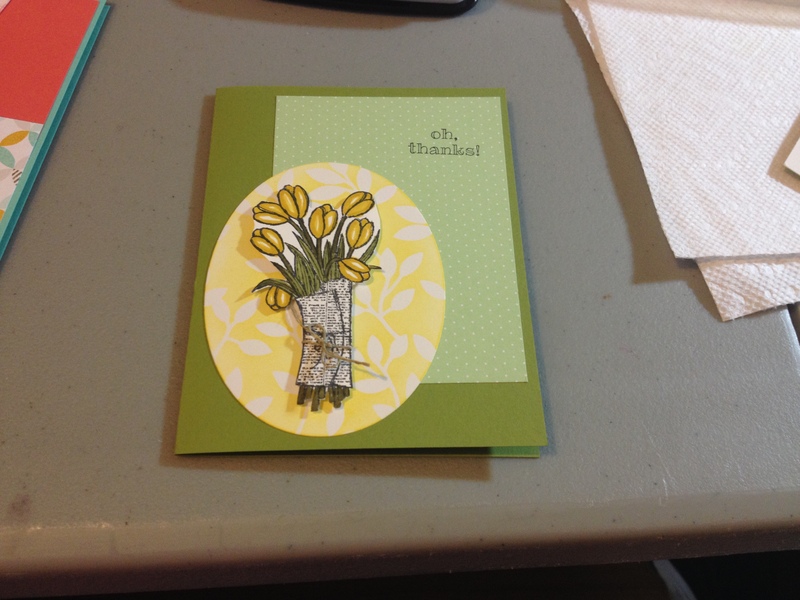 I also made another one of these cards for a co-worker’s birthday the other day. Just reminds me of spring, don’t you think? Tiffany thought to ask for the metallic silver stamp pad and the gem really looks nice stamped in silver! love it! Sharon hung her middle piece and it was just adorable! 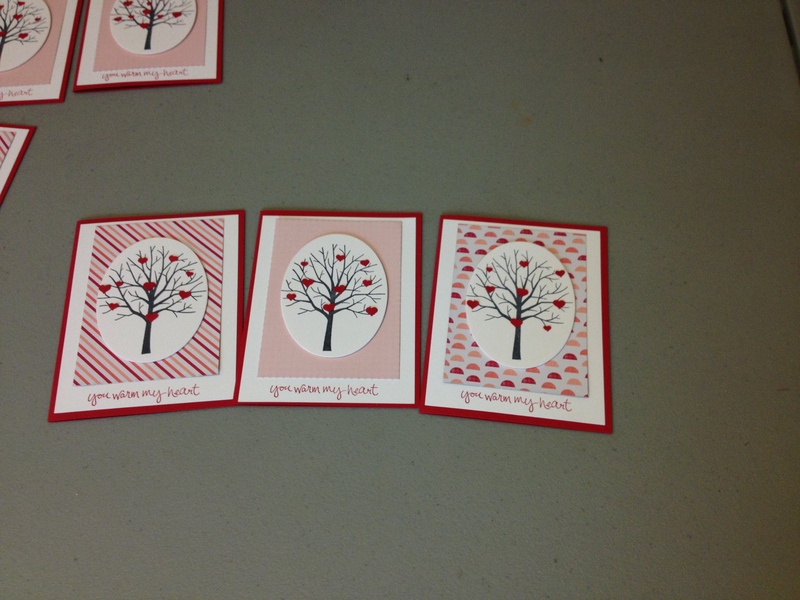 Joan hung all three of her stamped images, so sweet! For all you Paper Pumpkin subscribers, I’m thinking of moving the monthly party to the last Thursday of the month. According to my calculations, that should work for all but November and December for 2015… but I have plenty of time to figure out alternatives for those two months. So if you are one of my subscribers to My Paper Pumpkin by the 10th of each month, then you will get the invite. 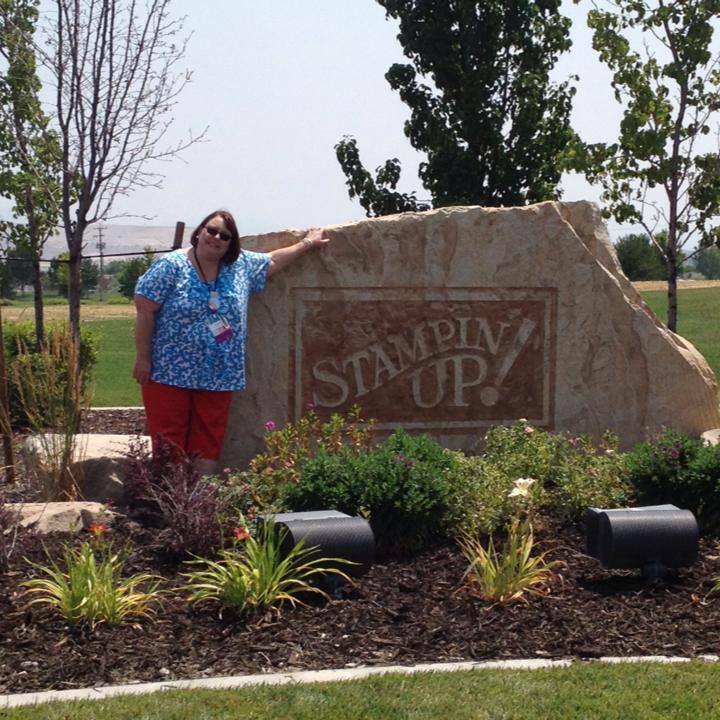 For my downline who subscribe to MPP on their own, they will be invited for a $10 fee each month (that is new for 2015), while space is available. Thanks so much for stopping by to read my blog today, I hope you all have a nice weekend. Stay safe out there, I’m hoping we don’t get this darn ice they are predicting- wouldn’t just light fluffy snow be nice? 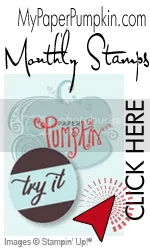 Subscribe to our monthly Paper Pumpkin Program at www.mypaperpumpkin.com Please be sure to type my name in the sign up page (as your demonstrator) Workshops and Classes offered in your home or mine featuring: scrapbooking (paper and digital), card making, paper crafting, Big Shot die cuts (by Sizzix), and a variety of 3D objects and gift items. Think of me for Birthday Parties, Kid Crafts, baby and bridal showers, weddings, and special anniversaries or parties where you need customized invitations or decorations! 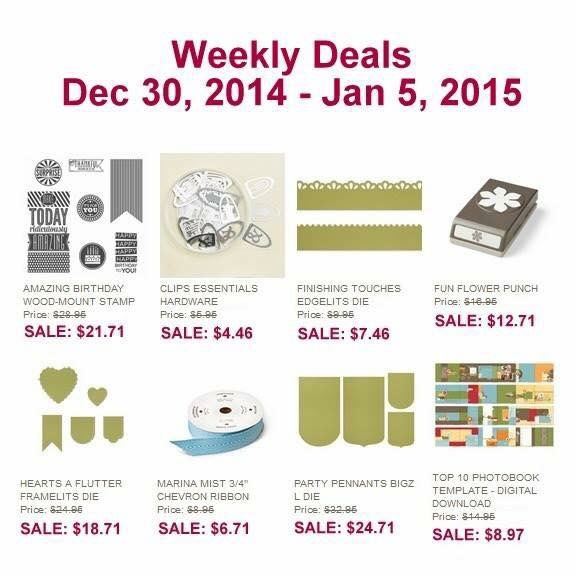 Oh, noooooo….the last Thursday, of the month…January is when I’m having my Stampin’ Up party for jamie. 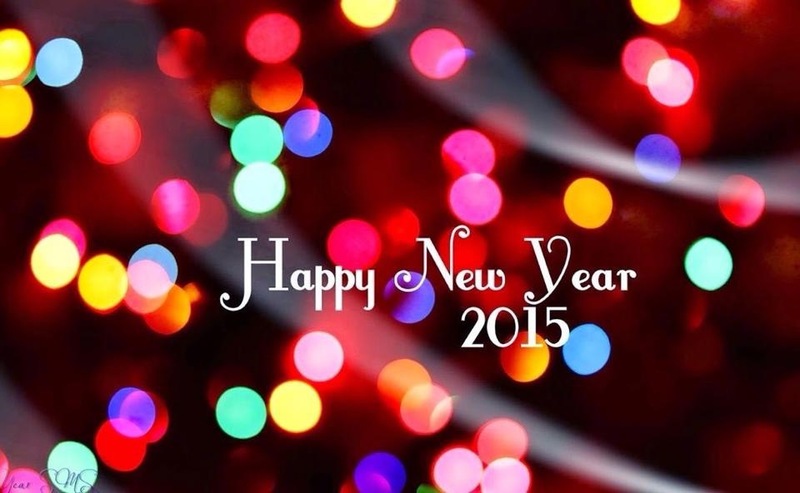 Boo-hooo….. Sorry Sharon- I should have asked everyone if this was a good date, or not… if no one else can make it then I will reschedule. thanks.